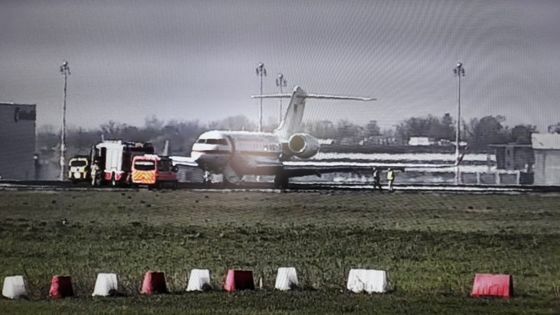 (Bloomberg) -- Berlin’s second-busiest airport temporarily shut down Tuesday after a government jet was forced to turn back shortly after takeoff and both wings scraped the runway during a forced landing. In the latest mishap to befall aircraft used to transport Chancellor Angela Merkel and her ministers, the Bombardier Inc. Global 5000 jet had to return to Schoenefeld Airport minutes after taking off for Cologne, a spokesman for the German Air Force said. No passengers were on board and the crew of three are being medically examined as a precaution, the spokesman added. The closure led to widespread delays and some aircraft were rerouted to Berlin’s Tegel airport, an airport spokesman said. Government aircraft carrying cabinet members including Foreign Minister Heiko Maas, as well as President Frank-Walter Steinmeier, have been grounded by technical problems in recent months. An aircraft carrying Merkel had to perform an emergency landing in Cologne last November due to an electrical system failure. The Global 5000 jet can carry 13 passengers and reach foreign capitals including Washington. The jet involved in Tuesday’s incident entered service in 2012, the Air Force spokesman said. Schoenefeld is the second-busiest Berlin airport after Tegel. Airlines operating there include Easyjet, Ryanair, Norwegian Air and Aeroflot.